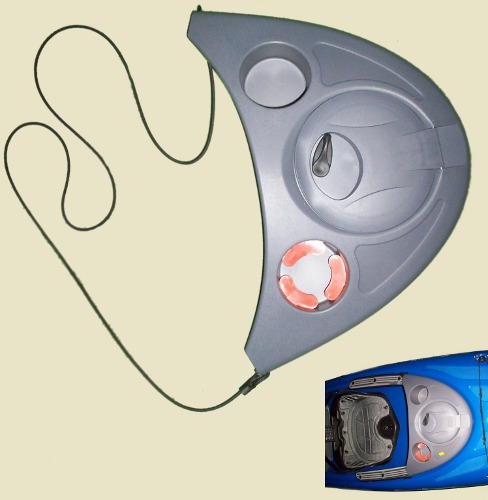 Don�t lose your Mirage drive unit; keep it secured to your kayak with our Deluxe Leash. 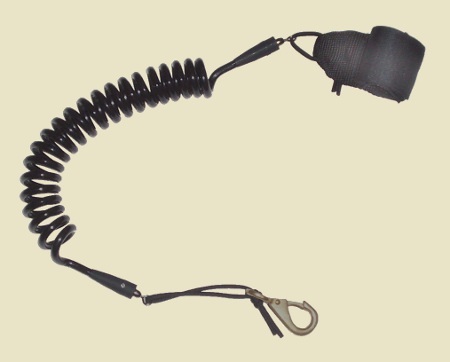 This webbing style paddle Leash is constructed out of high-grade tubular webbing with a stretchable bungee core. Intelligent construction keeps the leash coiled with a minimal profile while protecting your investment. Brass clips won�t corrode in salt water. Position these oversized Drip rings beyond your hands but above water level. They'll do a great job of keeping water drips off your hands and legs as you paddle your kayak. Easy to install Drip ring set; If you have a 2-piece paddle they just slide on. Zip ties provided, just in case you have a 1-piece paddle. Fits all adult kayak paddle shaft diameters we've seen. 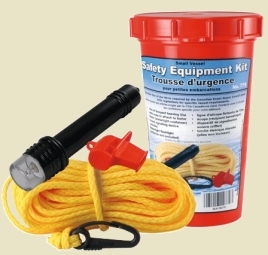 If you bought a kayak that did not include a drain plug, this kit will get you set-up. 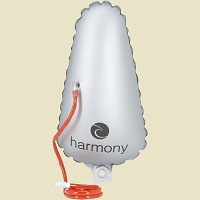 It's great to have a drain plug to easily drain any water from inside your hull. 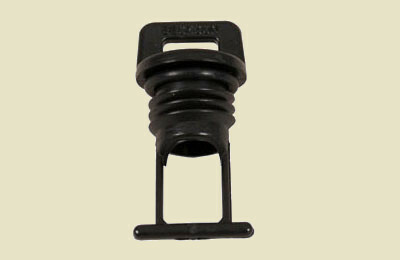 This is a complete drain plug and housing for Necky, Old Town or Ocean Kayaks. Good for most other brands too! two cherry rivets for easy install -even if you can't reach the inside of the hull. -you'll need a rivet gun tool to tighten the rivets. two nuts and bolts -you'll need access inside the hull in order to tighten the nuts. 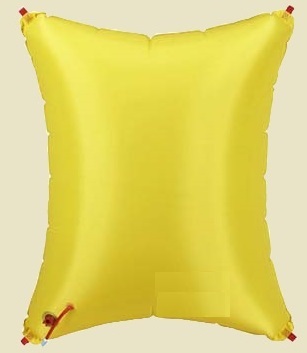 Secures spare paddle close at hand for immediate use. 1 1/8" diameter nylon clips. Install with four 10-32 5/8" screws. Not designed to secure paddle when cartopping. 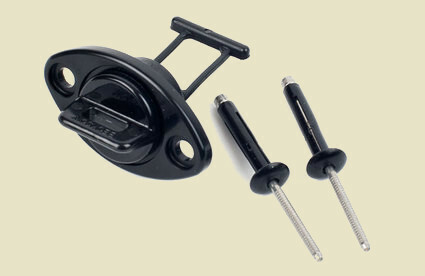 Great for attaching extra gear to the deck of your recreation and touring kayaks. Great for on-deck storage and convenience. 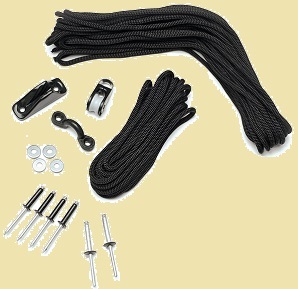 Includes bungee, deck loops, hardware and instructions. Easy to install. 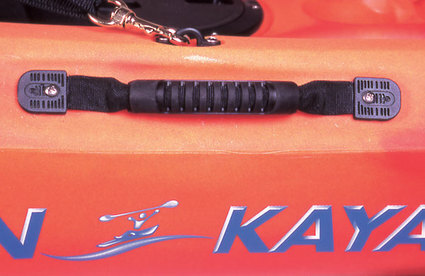 Deck Loops are installed onto your kayak, then run the bungee thru them and tie a knot. Choose hardware type in kit... nut/bolts OR rivets. 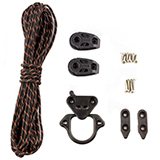 This kit with surface mounted EZ Plugs allows you to attach a bungee deck rigging system onto your kayak deck. Quick and easy to apply instant adhesive (Super Glue) requires no tools or drilling. 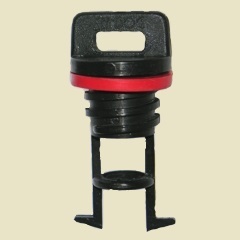 EZ Plugs attach well to relatively flat smooth surfaces. 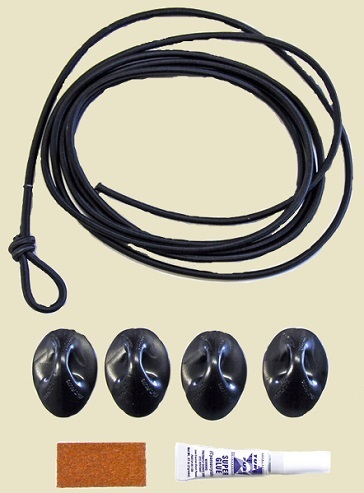 4 EZ Plugs, Superglue, Elastic bungee cord, instructions. 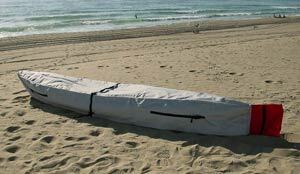 This Deck Bag is the ideal accessory for your Kayak. 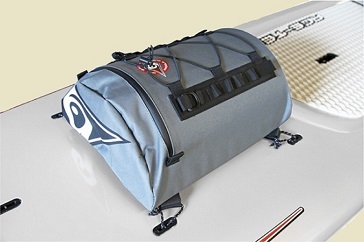 This 30 liter bag fits directly onto any Kayak deck fitted with 4 deck attachment points in a 15"x15" square configuration. A large and easily accessible top opening, water resistant finish. 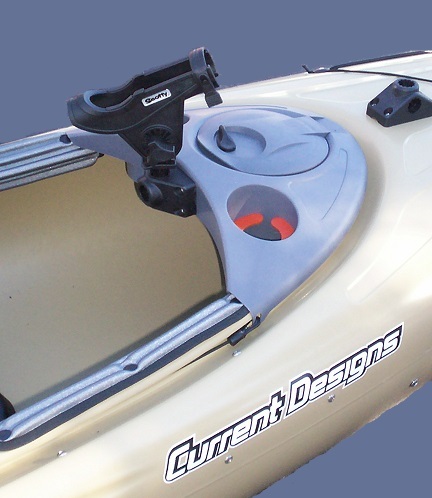 4 Velcro straps + rope loops for attachment directly to your kayak deck. Shoulder strap, large internal drink bottle pouch, small internal pocket for car keys. 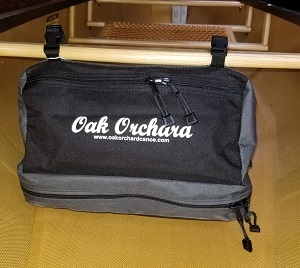 Internal water resistant pouch for goods requiring extra protection, and an outer top bungee cord for even more. Lightweight. Reliable. Easy to adjust. 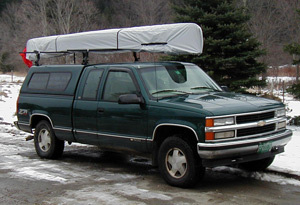 We've seen these in many brand and models of kayaks over the years. Keepers foot braces (aka... foot pegs, foot pedals) are standard equipment in most Dagger, Perception, and Mainstream kayaks with and without rudders. Also found on newer Wilderness Systems kayaks that have rudders. Other Wilderness Systems kayaks have the Slidelock footbrace, which we also stock. 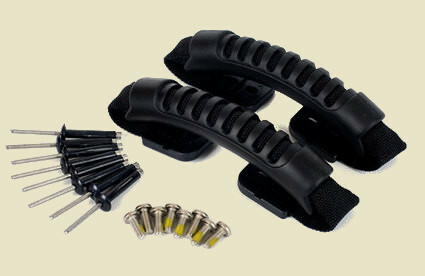 If you don't have footbraces in your kayak now you really should get this kit. 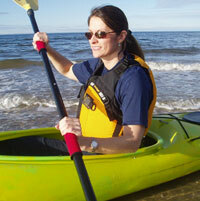 Keepers will work well in just about any kayak -we've even seen them used in canoes. Includes; two 16" Keepers Tracks, two foot pedals with trigger levers, hardware and instructions. Mounts to holes that are 14 5/8" apart. This is just the Replacement Keepers Foot Peg with trigger for right or left side of Keepers foot brace tracks. 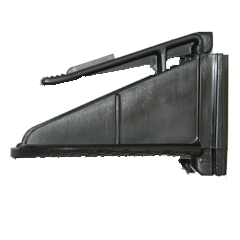 This includes the trigger lever on the back side of the peg (used for adjustments). 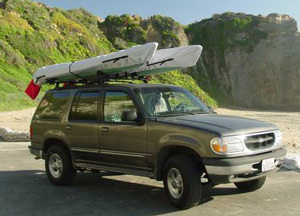 We've seen these in many brand and models of kayaks over the years. 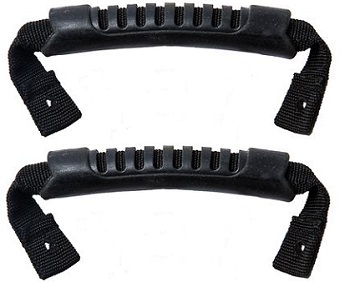 Keepers foot braces (aka... foot pegs, foot pedals) are Standard equipment in most Dagger, Perception, and Mainstream kayaks with and without rudders. Also found on some Wilderness Systems kayaks. 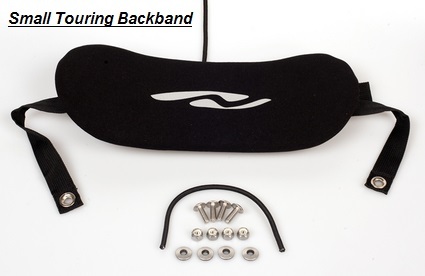 Other Wilderness Systems kayaks have the Slidelock footbrace, which we also stock. This is just one pair of replacement foot pegs with trigger levers. Sale, $14.95 each OR $18.95 for a Pair. This Kayak footbrace adjusts easily with an extension rod that places positioning literally at your fingertips -no more reaching way down into the hull to find that hidden trigger. Simply lift the grip at end of rod, slide pedal to desired position and lower grip. No more sticking your head down inside the cockpit or training your toes to be fingers! Full 14" range of pedal adjustment. The SlideLock is specifically designed to provide secure footbrace position and to resist pop out. Standard equipment in most Wilderness Systems kayaks and some Dagger and Perception kayaks. 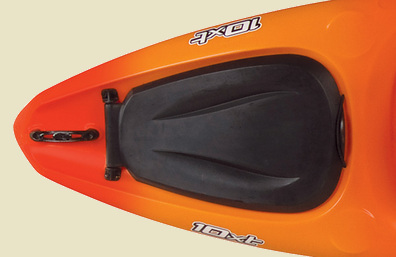 Retrofit-able to most kayaks. 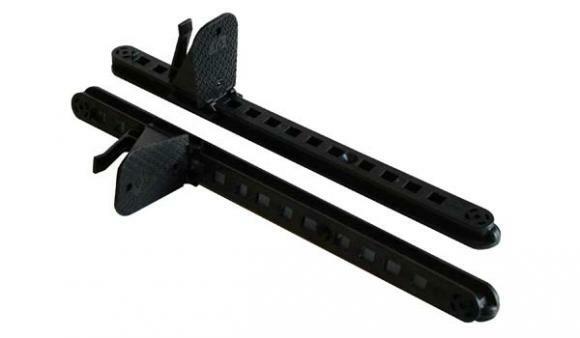 Multiple mounting points allow you to choose holes that are 14 5/8" or 16 1/4" or 17 3/4" apart when installed. If you don't have footbraces OR you don't like the ones that came in your kayak -this is the one to buy. 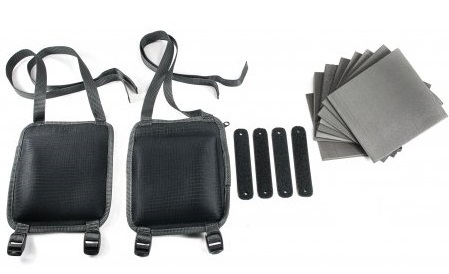 Kit includes pair of footbraces, hardware and instructions. 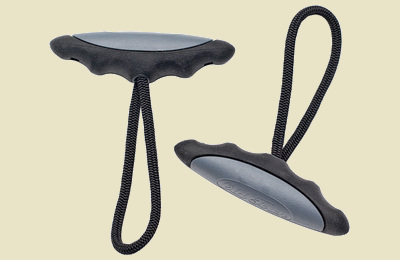 Padded, contoured carry handles take the pain out of carrying a kayak. Our custom contoured design fits any hand allowing a solid non slip grip. Sold in pairs, one for each end. These handles have NO logo! Choose handles with Necky, Old Town or Ocean Kayak logo! 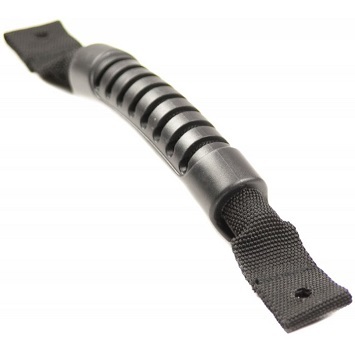 Padded, contoured carry handle take the pain out of carrying a kayak. Our custom contoured design fits any hand allowing a solid non slip grip. Sold here individually for one end of your kayak. 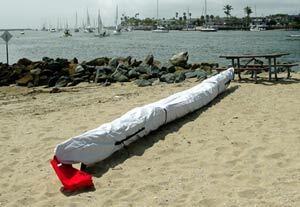 Danuu "cover Me" Kayak Covers are the answer to all paddlers' dreams - an affordable, hassle-free solution for protecting your boat! The covers are 100% UV resistant polyester with a water resistant coating on the inside of the material which is great for outdoor storage OR indoor storage. 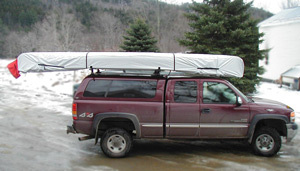 The cover fits over the kayak - top side up OR bottom side up, and can be used on top of a car or on a trailer. 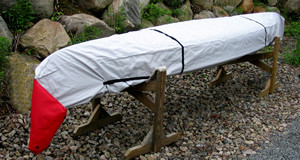 Overall cover dimensions, Length: 12' 6" Width: 49". Overall cover dimensions, Length: 15' Width: 49". 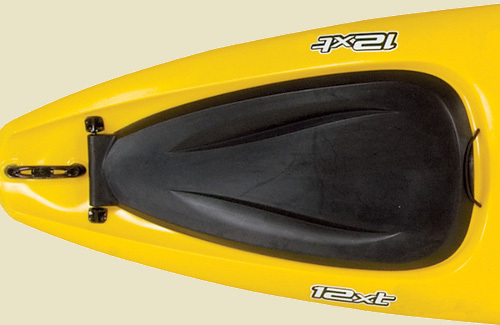 "Dude" cover was created for Tandems and other Wider Kayaks. Overall cover dimensions, Length: 16' Width: 55". Overall cover dimensions, Length: 18' Width: 49". Overall cover dimensions, Length: 20' Width: 41". Overall cover dimensions, Length: 22' Width: 41". Overall cover dimensions, Length: 26' Width: 41". You've heard "you wear a kayak" but these days kayaks are built for the masses... aka, not you. Solution; outfit your kayak for a snug fit and better performance. Hip Pads are Nylon covering closed cell foam. 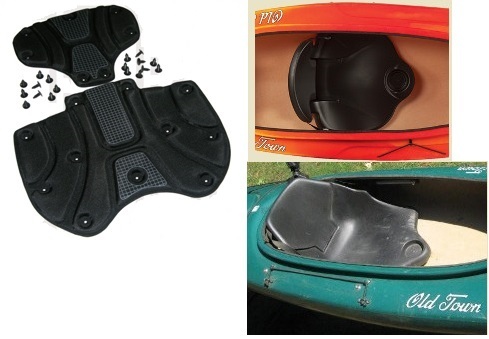 Hip Pads quickly strap around your kayak's seat support pillars. For permanent installation you may use included hardware. 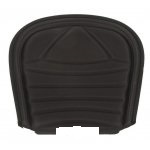 Includes; 2 oversized hip pads with foam wedges and spacers as needed for your ideal fit. 3" thick Minicell for custom outfitting your canoe or kayak. Sheet of soft Minicell foam. Closed cell, does not absorb water. 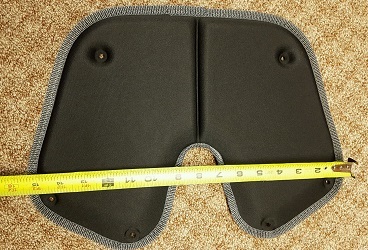 Great for custom seat pads, padding thigh braces, hip pads, canoe yokes, etc. Easily glue to any surface with contact or rubber cement. 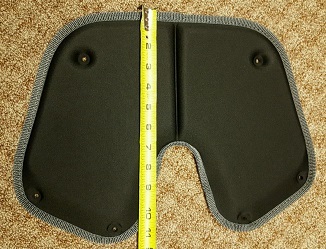 3/16" x 12" x 22"
Sheet of soft Neoprene foam for outfitting. Closed cell, does not absorb water. 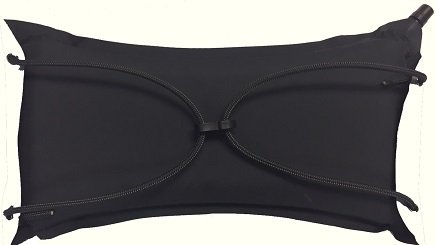 Great for custom seat pads, padding thigh braces, hip pads, canoe yokes, etc. Easily glue to any surface with contact or rubber cement. 1/4" x 12" x 17"
1/4" x 12" x 46"
A kid sized seat. For use in rear cockpit of the Necky Manitou II tandem kayak. 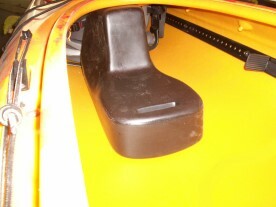 A replacement seat base for Necky kayaks that were originally outfitted with this seat. 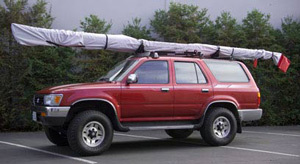 Can be used for custom seat installations, such as wooden kayaks, home made kayaks, racing kayaks. 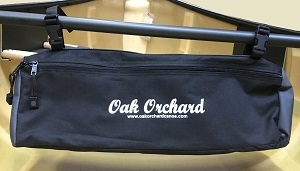 Generally combined with a Back Band style backrest. 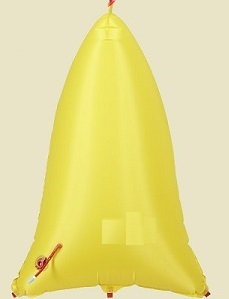 Made of highly contoured and durable molded foam rubber for excellent support. 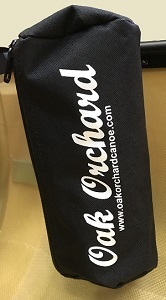 Designed specifically to reduce pressure on your sciatic nerve and to prevent your feet and legs from falling asleep when you're out paddling. This seat pad does not retain water. 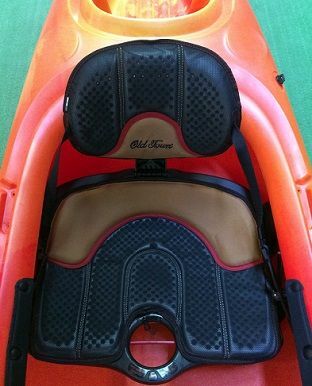 This seat was common on Necky touring kayak models such as: Chatham, Elaho, Elias, Eliza, Looksha Elite composite and also the Vector sit-on-top. 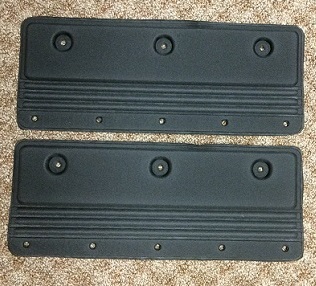 Includes: Male and Female Velcro strips on the bottom and push rivets for each side. 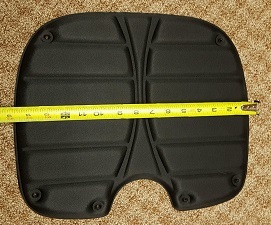 Certain Necky kayaks are outfitted with a Seat Frame used in conjunction with this pad. Such a seat frame is not needed for all models. 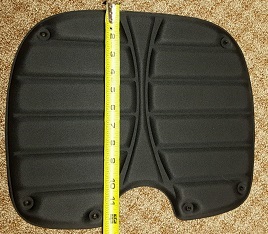 Seat Dimensions: 16 inches front to rear, 18 inches side to side. Got a wimpy back rest? 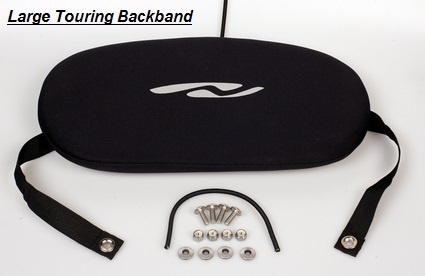 This comfortable and supportive back band adjusts on each side with ratchets. 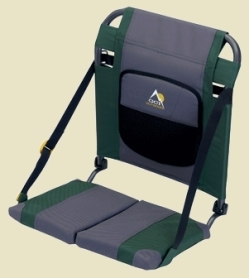 Provides ample lumbar support, movement and comfort for most body types. This is an easy upgrade to replace your old seat back. 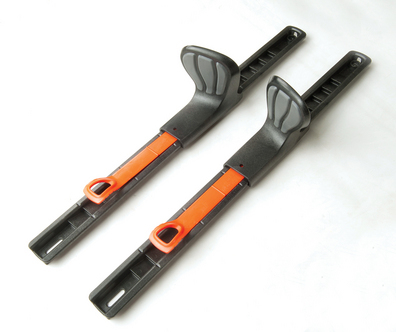 We recommend the Small Necky backband for whitewater kayaks OR low volume sea kayaks. The Large Necky backband is great for most other kayaks; OR if you just prefer more back support. Seat Pads provide padding inside the cockpit so your rear is not against hard plastic. 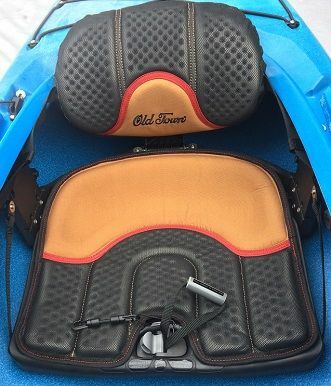 Found on good kayaks like Perception; fits tons of different brands and models. Perception' special design pad offers enough pad thickness to make a day on the water comfortable. Durable and easy to clean. Six pins secure the pad to the existing seat pan. Easy Install. Drilling is required (unless you're just replacing old ones mounted the same way). Hardware included. Perception' special design pad offers enough pad thickness to make a day on the water comfortable. Just Peel-n-Stick to secure the pad to the existing seat pan. Additional adhesive may be required on a rough texture surface. Our Pad's closed cell construction is durable and easy to clean, does not absorb water. May trim to size with scissors. Need a new backrest? This fits lots of Perception kayaks. Perception's special design provides good back support to make a day on the water comfortable. 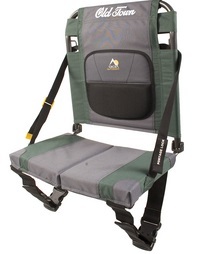 Generally you can use your existing back adjustment strap; just run it thru the keeper on the rear of this seatback. A bungee cord hold the backrest down into the seat pan. Type A; the bottom of this backrest fits down into a single 9" long groove in the seat pan. Type B; the bottom of this backrest fits down into two separate 3" long grooves in the seat pan. Need a more back support or comfort? 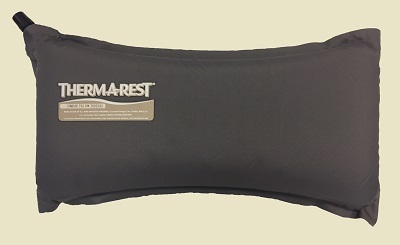 We've found that this Lumbar Support Pad makes a big difference and that it pad fits lots of kayaks, as long as you have some type of backrest to clip on to. 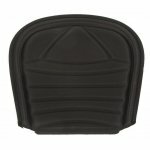 Jackson Kayaks Lumbar support Pad with add tons of comfort to your new OR old kayak seat. Easy Attachment to your existing backrest. Adjustable valve for just the right amount of padding. The "Dimension Adjustable Seat Back" is a densely padded articulating seat back that combines form, function and comfort like never before. Quick and easy height adjustment allows for wet entry, spray skirt attachment, rolling and transport. 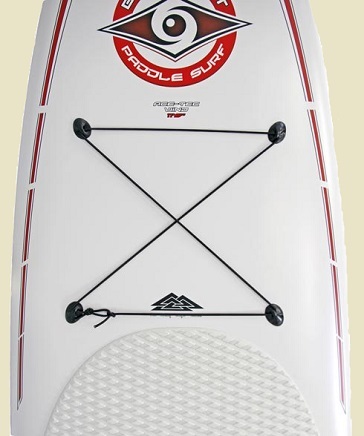 The fully articulating back pad encourages and enhances the complete range of a paddlers motion. All while providing superior comfort and support that will drastically increase your paddling enjoyment. Backrest is nicely padded for all day comfort. Backrest pivots to move with your body. 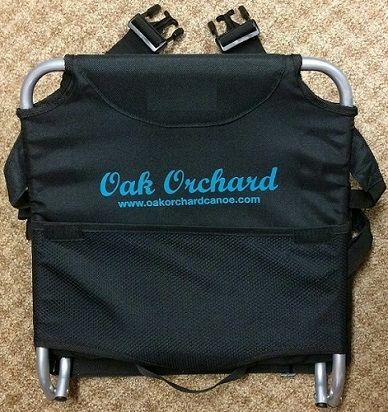 Backrest is easily adjusted up or down to find that sweet spot on your back. Fits all new OR older model Kestrel, Vision, Breeze, Whistler, Storm, Squall, Solstice, Titan, Nomad, Extreme, Expedition and Squamish kayaks made by Current Designs. These models have a perpendicular groove in the seat pan where the backrest is held down by a bungee cord and a strap is used to adjust backrest angle. You can easily upgrade your previous seat backs with the more comfortable, more adjustable Dimension Seat Back. 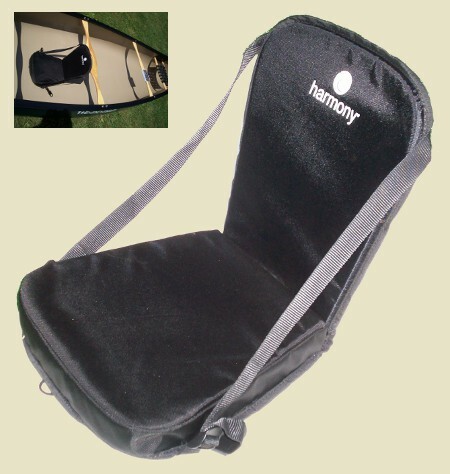 The Dimension BackRest can not be fitted into British or Greenland style boats that come standard with a back band. Shown here with our "UltraLight Composite seat". Also a compatible with our "Revolution seat". 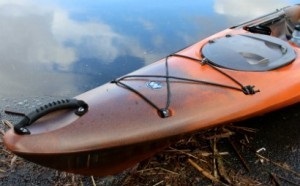 A simple and efficient way to secure your paddle to your kayak. Also works great to stow your fishing rod until you get to a good spot. Includes all hardware. 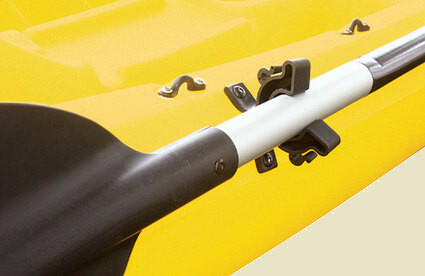 Easily mounts to any kayak. So handy you'll wonder why this isn't standard equipment on every kayak. Sometimes simple is the best design for a product and the Scotty Paddle Clip is not only simple, it's STRONG! We spread out the mounting points, opened up the size of the mounting holes, beefed up the sidewalls and made sure it securely held every paddle we clipped into it. 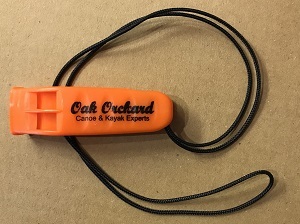 Mount it in a convenient location on your watercraft and... no worries, this low profile clip will take care of holding your paddle! Mounting hardware Not included. 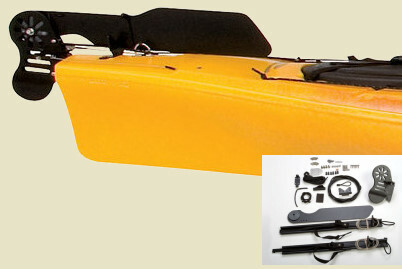 A complete rudder kit just for current model Old Town kayaks. 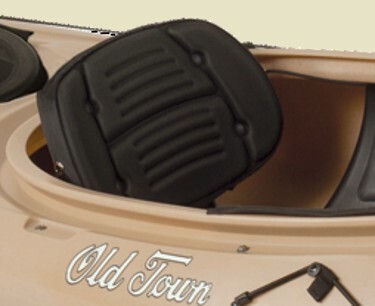 We buy parts direct from Old Town and include specific instructions for your kayak model so that we can offer you new rudder kits for current models or classic Old Town models discontinued years ago. A rudder helps the boat track (go straight) even in difficult conditions, like wind and currents. A rudder can also help you turn, with foot pedal controls, without interrupting your forward paddle strokes and momentum. Rudders are very helpful on tandem kayaks. 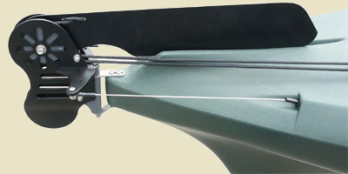 The Blade rudder system allows you to easily raise or lower the rudder while seated in the cockpit. 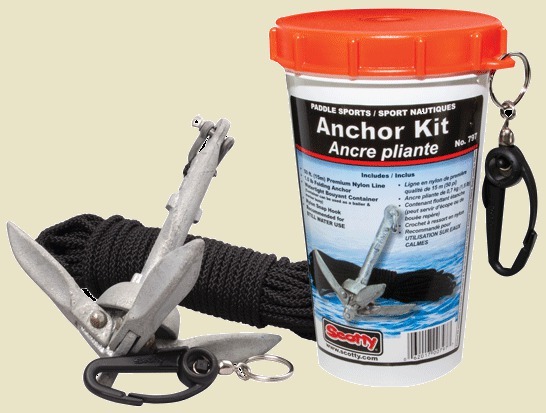 Each kit comes with the rudder, mounting hardware, and detailed instructions for installation. Available online for Loon 160t tandem, Loon 15 tandem, Castine, Nantucket, Cayuga (110, 130, 146 and 160) and Dirigo Tandem Plus. Important; your kayak needs to have 4 nuts molded into the stern OR an existing hole at the stern end which the rudder shaft may be mounted! Some Older models may not have these features. Exception being the Dirigo Tandem Plus (or Dirigo XT Tandem Plus) for which we have two rudder kits... one for versions with a hole at the stern and the other for versions with four nuts molded into the stern (2013+). 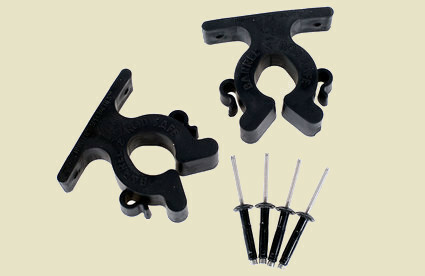 New models like Predator 13 and Predator XL have 4 nuts molded into the stern to hold the Rudder mount bracket. Call us to order if you need a rudder for an older Old Town kayak model or one we do not show here. 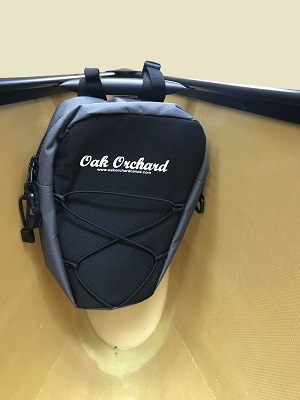 For older models such as Loon's, Castine and Nantucket it is helpful for us to know which of two footrest styles are in your kayak, so we may send the most ideal parts with the kit. Not sure? call us; 1-800-452-9257. A complete rudder kit just for classic model Old Town kayaks no longer in production (or older variations of current models). We buy parts direct from Old Town and include specific Old Town instructions for your kayak model so that we can offer you new rudder kits for current models or classic Old Town models discontinued years ago. A rudder helps the boat track (go straight) even in difficult conditions, like wind and currents. A rudder can also help you turn, with foot pedal controls, without interrupting your forward paddle strokes and momentum. Rudders are very helpful on tandem kayaks. Standard setup for a tandem is rear person controls the rudder using the rear footbraces. Important; your classic model Old Town kayak needs to have an existing hole at the stern end which the rudder shaft may be mounted! Older models may not have this feature. 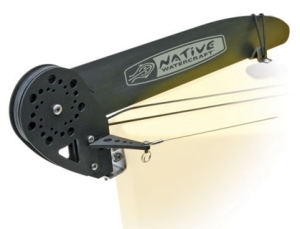 Native Watercraft rudder kit. 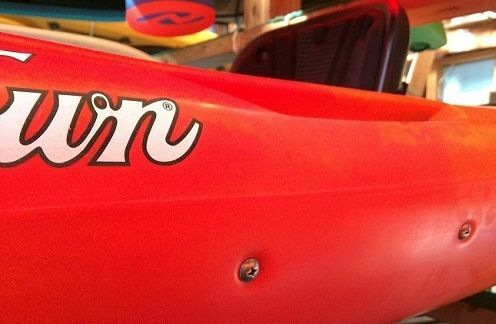 Fits Ultimate, Manta Ray, and Marvel kayaks by Native Watercraft. Standard setup for a tandem is rear person controls the rudder using the rear footbraces only. Allow 2-3 weeks for some models. Fits Many standard Dagger or Perception models -you'll need to be sure your kayak has a hole at the stern to receive the rudder pin. Standard setup for a tandem is rear person controls the rudder using the rear footbraces only. Fits Wilderness Systems Tarpon, Tsunami, Cape Lookout, Cape Horn and Pamlico kayaks. Standard setup for a tandem is rear person controls the rudder using the rear footbraces only. Includes tubing, instructions and hardware. 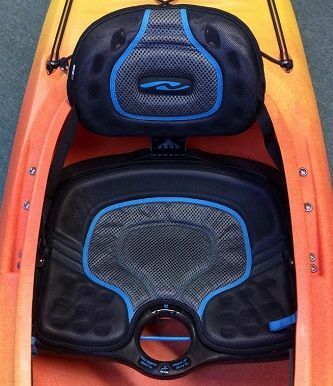 Choose the standard Necky Kayaks Rudder kit OR the tandem rudder kit, which has an oversized blade for tandems. This would make a great rudder for a kayak with a sail rig. Standard setup for a tandem is rear person controls the rudder using the rear footbraces. 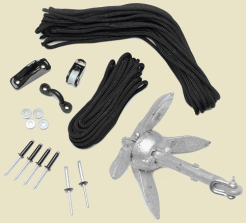 Includes footbrace tracks, rudder blade, cables, mounting hardware and instructions. Classic Tandem fits the Necky tandem models with a flat stern such as "Sky 2" or "Gannet II". Fits Current Designs Breeze, Kestrel 140 (poly), Solara 135 (poly), Vision 135, or Whistler. Standard setup for a tandem is rear person controls the rudder using the rear footbraces. 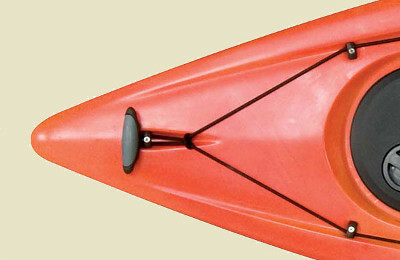 Fits most Old Town, Perception, Dagger and many other one person model kayaks that normally offer a rudder option at the factory and have a moulded hole at the stern to receive a rudder. If your brand and model is not listed please contact us. Not recommended for tandem kayaks (see our other options). Broke your rudder? This rudder assembly replaces many of the older style Old Town, Perception, Dagger, Mainstream and many other tandem models that normally offer a rudder option at the factory and have a molded hole at the stern to receive a rudder. 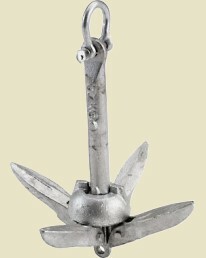 Includes rudder body mounted on stainless pin, with lines. 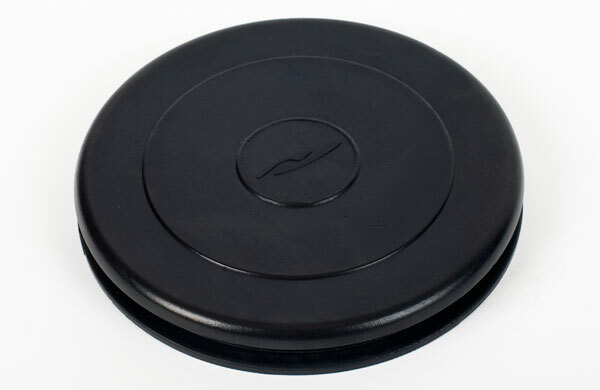 This is the Round black rubber hatch as found on Impex Kayaks such as Montauk, Mystic, Currituck and Force models. Also some other brand kayaks. May be a Bow hatch or a Day hatch depending on model. Lasts a long time if treated with "303". This is the replacement 9" Round hatch. 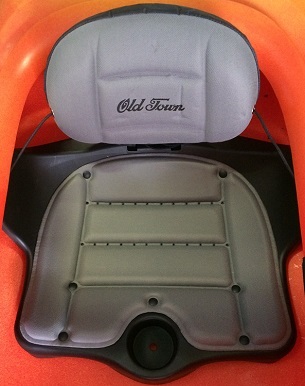 This is the Oval black rubber hatch as found on Impex Kayaks such as Montauk, Mystic, Currituck and Force models. Also some other brand kayaks. May be a bow OR stern hatch depending on model. Lasts a long time if treated with "303". This is the replacement OVAL hatch. 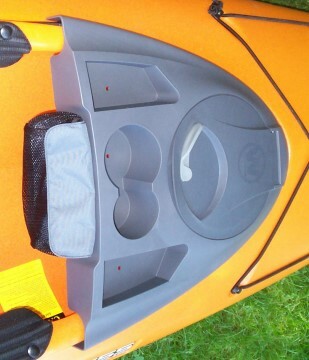 This is a round, black rubber hatch found on Necky Kayaks such as Chatham models. Also some other brand kayaks. May be a Bow hatch or a most common a Day hatch, depending on model. Lasts a long time if treated with "303". 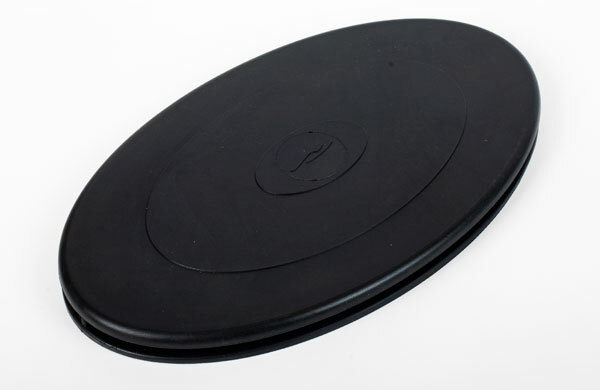 This is the replacement 9" Round rubber hatch. 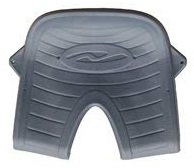 This is the Oval black rubber style hatch found on Necky Kayaks such as Chatham models. Also some other brand kayaks. May be a bow OR stern hatch depending on model. 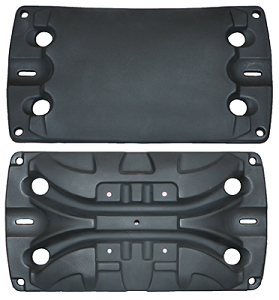 This is the replacement OVAL rubber hatch. Fits the Current Designs Solara. The Wilderness Systems Pungo Work Deck Console provides easy access to your gear. 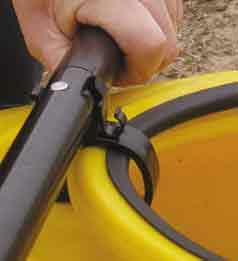 A bungee securely attaches the work deck to the your kayak's cockpit rim, much like a sprayskirt would be mounted. Fits the Wilderness Systems Pungo 100, Pungo 120 and Pungo 140 (Gen2 Poly AND Duralite models.) 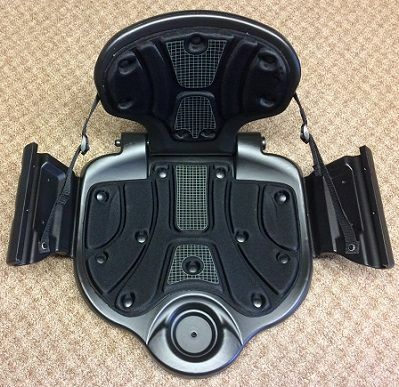 Note: best fit on Pungo 120 and 140 -reduced knee room on Pungo 100 due to it's smaller cockpit. 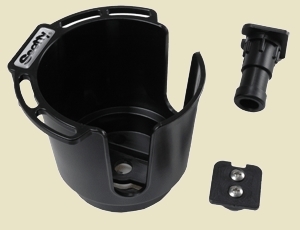 Center cup holder to hold bottles or cans. Watertight 8-inch Orbix hatch for dry storage. 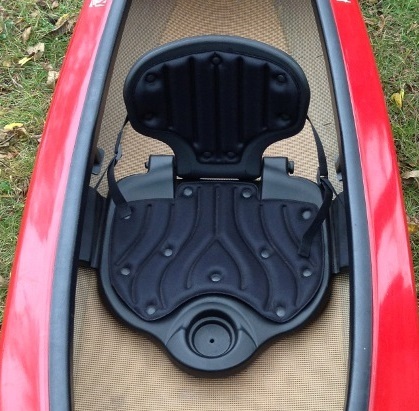 Nucanoe Multi seat base. For use in Frontier 10 or 12 by NuCanoe. Seat may be used to sit on directly like a bench seat (upper picture). OR flip the seat over to mount a swivel seat in the properly located threaded mounts (lower picture). 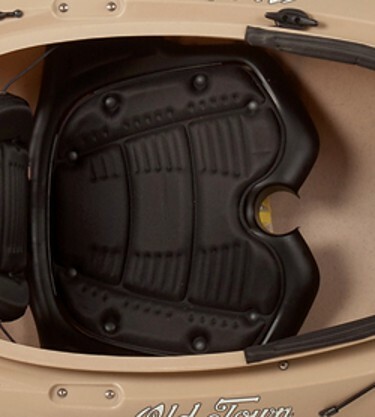 Includes one seat with hardware to secure base in NuCanoe's Freedom tracks found on Frontier models. Nucanoe Rigid seat base. For use in Frontier 10 or 12 by NuCanoe. 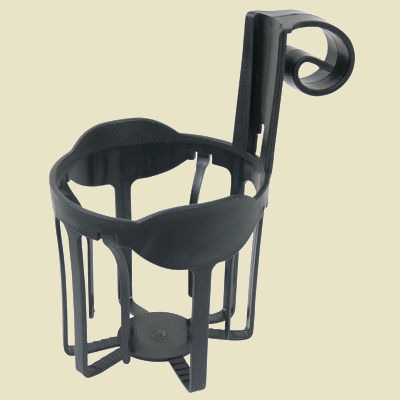 Seat may be used to mount a swivel seat (such as Max 360 or Pinnacle) in the properly located mounting holes. Includes hardware to secure the base into Freedom tracks found on the floor of NuCanoe Frontier models.